This 2-Pin extension cable can be sued for sensors which are too far away from the monitoring device. Especially in larger cases or when attempting cable management out of sight these extension come in very hand. 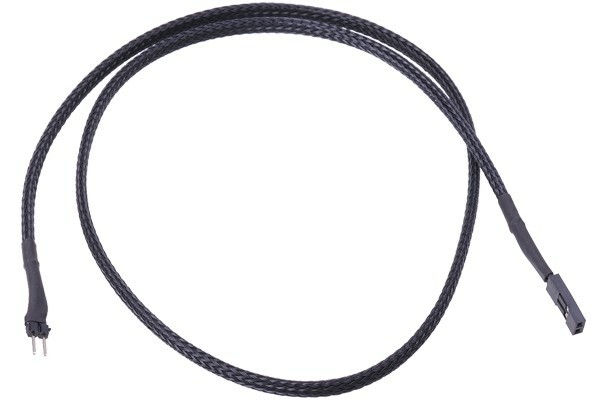 Of course this cable can also be used for many more applications such as the case speakers or power- or reset-button. This cable is not only practical, it is also optically appealing, The surrounding mesh, also called mesh, which is surrounding the cable itself offers the advantages that every Pro-modder is looking for: A completely unique look, even of the cables in the system! Special attention was paid to the combination of cable connectors, sleeve and heatshrink which were used to ensure great design and a unique as well as elegant look. 1 evaluation(s) in other languages. Verarbeitung könnte etwas besser sein aber für den Preis absolut top!